Home • Architecture • Environment • Shifts in planning culture? In his book, Welcome to the Urban Revolution, Jeb Brugmann argues that bottom-up planning is essential for the survival of cities. In contrast to this, recent reforms to the NSW planning process, particularly in relation to ‘State-significant projects’, or in planning jargon ‘Part 3A’, could be said to belong to the top-down school of planning thought. A classic example of these divergent approaches to urban development is currently being played out at St Vincent’s Hospital, Sydney, on an urban site south of Kings Cross, overlooking the terrace houses of Paddington. Much like the title would imply, Part 3A applies to projects determined by the Minister for Planning to be of special importance to the state as a whole. Clearly, this sets up a tension with local communities and councils, who see local contextual issues potentially downplayed in favour of bigger issues to do with the economy, jobs or ensuring critical infrastructure is sustainable. St Vincent’s specialises in cancer care and is one of Australia’s most important hospitals. It is keen to consolidate this role and do more to help cancer sufferers. The hospital has recently submitted to the NSW government, under Part 3A, plans for two important but very large buildings on its campus. One is the Garvan St Vincent’s Campus Cancer Centre, a 12-storey box significantly higher than neighbouring buildings. The second is the UNSW Virology Centre, which at 10-storeys is also a building of substantial height. The first project is designed by BVN and the second by Daryl Jackson and Robin Dyke, and there is no doubt that both could very well turn out to be handsome buildings. The local council, Clover Moore’s City of Sydney, is understandably concerned about the contextual misfit nonetheless, and has taken a proactive position by submitting its own proposal, featuring much lower buildings, to the state government. 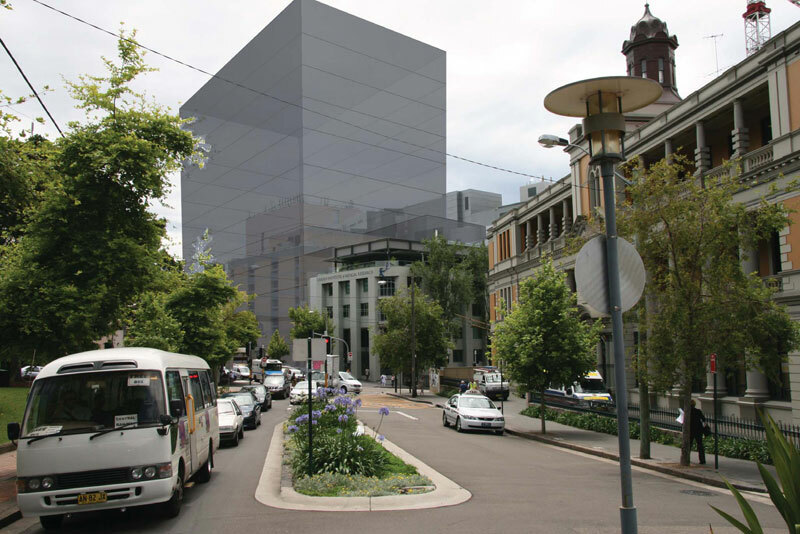 This proposal, however, can only work if one of the buildings is relocated off site – as the Virology Centre is a research centre related to the University of NSW, the City has suggested that it could be located on the university campus. 1. Should an architect only take into account the client’s brief, or should they also take into account the broader public benefit? 2. If the facilities are essential infrastructure for the state, should local communities compromise their amenity for the overall good of society? 3. Should existing context overly determine the future form of the city? 4. How proactive should local councils be in preparing their own masterplans for Part 3A sites? 5. Is the free access to web-based information on planning projects leading to a new democracy in planning? The first question relates to how the importance of the client’s brief should be weighted in comparison to the needs of the broader community. The Australian Institute of Architects makes it clear that their members’ first duty is to the broader community, followed by the client. The difficulty here lies in assessing who this “broader community” is and what their needs might be, particularly when self-interest and NIMBY attitudes often motivate action groups to fight change. In Europe, the individual client is probably less critical as a result of the requirement for competitions for so many buildings, particularly public buildings. This sets the architect the rather different objective of designing a competition-winning object, one that may not necessarily have resulted from a community consultative process. Although normally, of course, there is general agreement on planning principles, particularly in relation to height and bulk, before a competition starts. So was there an agreed, approved set of height and bulk requirements for the St Vincent’s site? The answer seems to be yes. As recently as 2005 a master plan for the site was prepared and presented to the community, receiving broad support. The City of Sydney argues that given the master plan was prepared only four years ago, it should have been the control the buildings adhered to. There is, however, another well-known proposition put forth by the architectural profession that it all depends on the quality of the design. Clearly this argument is not going to win out with most communities, which are concerned first and foremost with their own amenity. The Horizon Tower, located not far from St Vincent’s, is a case in point. The tall building is a well-designed artefact, but sits among much lower buildings and many believe it is located in the wrong place. The critical infrastructure argument runs that the facilities are so important to the state that we must accept them. There is no doubt that the Cancer Centre must be located on the hospital campus, but the UNSW research facility is a longer bow to draw. The siting of the controversial de-salination plant at Kurnell in Sydney’s south, another piece of critical infrastructure, is more understandable. It must be located on the ocean edge near the population centre that it serves. But in the case of St Vincent’s, it does not appear to be critical to locate the research facilities on the current site and they could well be located at UNSW, as is proposed by the City. To safeguard against a potential loss of amenity, local communities often use the existing context argument to fight change. I have encountered this on a number of projects, including the Conservatorium of Music and the Walsh Bay redevelopment. But while major protests were mounted against these works, after completion everyone seemed happy enough with the results. There could be an argument that near transport nodes in the inner city, densities must increase and hence that the context must change. But while St Vincent’s is quite close to the inner city localities of Kings Cross and Taylor Square, it is also located on the edge of the Paddington terrace house area and not really close to Kings Cross station. These issues were no doubt considered when the 2005 master plan was produced, and as a result heights were kept much closer to the existing context. Question 4: Should local councils be more proactive? The role of the City of Sydney in this project is unusual. One would expect the City to express concern, but for it to take the trouble of developing its own scheme for the site is an unexpected turn of events. This gives concerned citizens a well-argued alternative to the formal proposals. The increasing ease of access to information through websites is also leading to more informed debate. The instant a project is posted online a series of critics and observers can download all the information from the Department of Planning – and in this case also see alternative proposals from the City of Sydney. Question 5: Are web technologies leading to a new planning paradigm? More democracy must flow on from the increasing amount of planning information available online. The use of new technologies to communicate with a mass audience was a critical part of Barack Obama’s campaign and is commonplace with cricket scores or stock market variations. I am currently working with ABC Radio in Sydney to prepare a series of segments on how individual buildings communicate. Segments on each building will be accessed in real time, in the real world, as you stand in front of the building itself, through the Bluetooth on your mobile phone. In a similar manner, all of the material relevant to the planning debate around St Vincent’s Hospital can be downloaded by savvy planning guerrillas or interested citizens. Information that previously was very difficult to gain access to has now become accessible. The future of democratic planning, as proposed by Jeb Brugmann in Welcome to the Urban Revolution, is to allow all parties to be involved so that they co-design, co-build and co-govern to their shared advantage. He calls this a ‘citysystem’ where residents, community leaders, investors, developers and professionals co-create the city. Web-based information is helping to stimulate this process. The next stage could be for the online viewer to test shadows with varying building heights, to test views of a development from various locations, to freeze their preferred solution and submit online. Of course this could lead to democratic chaos so like Sim City there needs to be rules… like an agreed masterplan setting down broad parameters of densities and heights. In the St Vincent’s case this could be the 2005 masterplan reframed as a citysystem.